Customers in Germany accessing the online Apple Store are no longer able to see the iPhone 7 and iPhone 8 as an available-to-purchase model, with only the iPhone XS, iPhone XS Max, and iPhone XR as the only options available. Previously, both the iPhone 8 and iPhone 7 were listed alongside the 2018 models, and are still available in other EU markets. Attempts to access the sales pages of both the iPhone 7 and iPhone 8 bounce users to the main German regional front page, showing the option has definitively been removed from that specific store. The removals follow Qualcomm's posting of a 1.34 billion euro ($1.52 billion) bond, one mandated as part of a ruling by the court in late December, deciding the iPhones infringed on Qualcomm's patents relating to power saving. Apple was ordered to stop sales and imports of any infringing hardware, and to recall units from third-party vendors. A statement on the matter supplied to AppleInsider by Apple claims "Qualcomm's campaign is a desperate attempt to distract from the real issues between our companies. Their tactics, in the courts and in their everyday business, are harming innovation and harming consumers." Apple goes on to claim Qualcomm "insists on charging exorbitant fees based on work they didn't do," and points out the investigations by various governments into the activities. "We are of course disappointed by this verdict and we plan to appeal," said Apple. 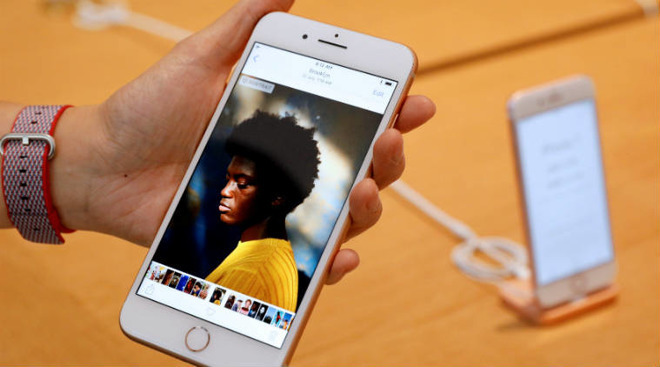 While all iPhone models are still available through carriers and resellers in Germany, Apple advised it would not be selling the iPhone 7 or iPhone 8 in its 15 retail outlets in the country, and that the current generation models will remain available to buy. The German iPhone ban is one of a number of recent events in Apple's ongoing legal battles with Qualcomm, primarily over patent licensing and infringement. In China, critics are attacking the company for seemingly flouting another court order banning the import and sale of some iPhone models. The two companies are also expected to head to court in the United States in April over some elements of the dispute. The fact Apple pulled the allegedly infringing models shows Apple’s seriousness in following through with their case against Qualcomm. It takes integrity to willingly suffer losses along the way to following through on what you believe to be the correct course of action. They must be very sure they'll win! God bless Apple for fighting Qualcomm tooth & nail. It shows Apple can’t get away with stealing intellectual property in All markets. They pulled it because of their dubious legal position. It shows that Apple is following the German Court mandate and us obeying the law. Not because of their dubious legal position. Do you even know how QC got the verdict in their favor in Germany when in other courts they lost for the exact same thing? Apple didn't "steal" anything. If anything, the actual company in dispute (Qorvo) didn't want QC to steal their technology when proof of innocence was presented in court. Elsewhere, Qorvo was allowed to present the evidence privately to the judge and exclude QC's engineers from looking at it and stealing it. Germany didn't do that, which is why I think QC will lose on appeal. By removing the phones, Apple was simply adhering to law. Nothing else. But to you... hey... surely it MUST mean Apple is guilty! Shame Apple didn't follow the contractual law they had with Qualcomm. Both companies are as bad as one another, greed and bullying must be written into their company charters. Pulling the older 7 and 8 models combined with Apple's aggressive promotions to update to the latest models will actually help to push users to the latest and fastest 'A' processors. This could pay off, since developers have to target the lowest common denominator, they will be more willing to put more robust features in their apps, e.g. more demanding games (better visuals), AR apps, etc. On the Android side the majority of the installed base is on cheap, lethargic processors, equivalent to iPhones several generations back. Geekbench multi-core scores the iPhone7 @ 5,734 and the iPhone XR (the next cheapest alternative) @ 11,212 - nearly double the speed! Not one Android phone scores above 8,900. And if they win on appeal Qualcomm must cover their losses. That's what the bond is for. You seem not to be aware of Qualcomm’s tactic in this particular case. A contract remains valid only as long as it is deemed legal. Breaking a contract that is executed in bad faith or that has an illegal basis frees the parties involved to break the contract and pursue legal action. This is what’s going on here. Which changes the merits of doing so not one whit. A lessor company might have been bowed to negotiation with Qualcomm, exactly as Qualcomm is attempting to force here. It’s Qualcomm who lacks integrity, refusing to stand only on the merits of their case against Apple having broken a contract. Instead, they are determined to fight dirty, to distract from the main issues and force Apple to the table. And Apple has stated as much in their response to this case and the one in China. If Qualcomm felt their position on licensing were defensible, they wouldn’t need to tarnish their image further with these pathetic sideshows. Apple is a willing licensee of any patent it’s using, but it requires two to negotiate in good faith for a fair deal to be struck. Perhaps the better way to put it is that a contract remains on foot until it is shown otherwise. One may allege the contract is illegal but you can’t unilaterally terminate a contract. You take that contract to court and allege some sort of illegality. If the court decides otherwise, you are likely to find yourself in breach as your own behaviour almost certainly means you weren’t fulfilling the contract. That’s why Qualcomm is posting a bond. What you're suggesting can be the case. But that isn't really what's going on with the Apple - Qualcomm situation. Relevant agreements between Apple and Qualcomm have expired. So there isn't, best I can tell from Qualcomm and Apple court filings, an ongoing contractual commitment which Apple is violating. The timing of its actions are related to the expiration of certain agreements it had with Qualcomm. ..altho IMO there's likely terms in the now-expired contracts stipulating obligations from both parties should the contract terminate and not be renewed. I've not seen any of the contract terms of course so just guessing based on licensing contracts I have seen before.